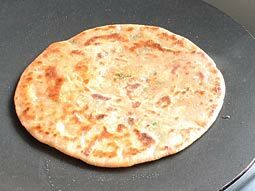 Aloo Paratha is a delicious shallow fried Indian stuffed bread popular among all generations of people across length and breadth of India. 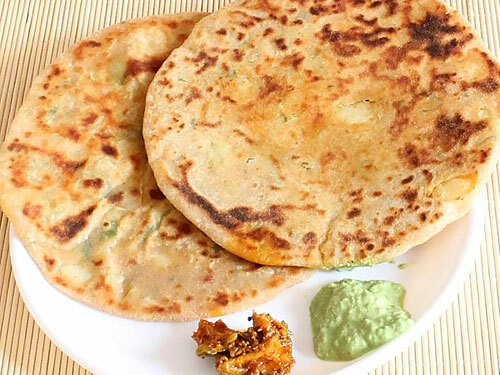 Contrary to popular belief, Punjabi aloo paratha can be easily prepared at home as this recipe uses ingredients that are found in every Indian kitchen. Plus, the detailed instructions with step by step photos will make it a breeze to cook like an expert. First prepare dough by taking 1 cup wheat flour, 1 teaspoon oil and salt in a small bowl. Incrementally add water in small quantities and knead smooth and soft dough (like chapati dough). Grease its surface with 1/2 teaspoon oil, cover it with clean muslin cloth and set aside for 15-20 minutes to settle at room temperature. Divide stuffing into 6 equal parts and give them a shape of ball. Divide prepared dough into 6 equal parts, give them a round shape and press a little to flatten like pattie. Take 1/2 cup dry wheat flour in a small plate for dusting. Take one dough pattie and coat it with dry wheat flour on both sides. (It will prevent dough from sticking to rolling board). 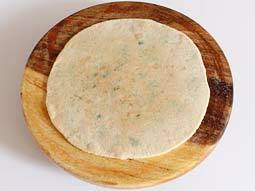 Put it on rolling board/roti making board (chakla) and roll it out into a circle of approx. 4-5 inch diameter using rolling pin. Put one portion of stuffing in the center of it. 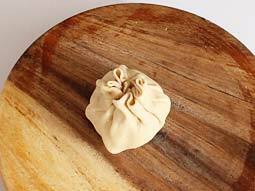 Wrap stuffing ball by lifting all sides of rolled circle towards top, seal the edges and again give it a round ball shape. 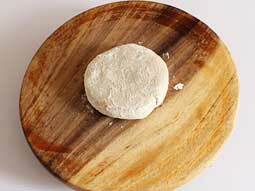 Gently press stuffed ball on rolling board and dust some dry flour over it. Roll it out into circle of 6-7 inch diameter (like roti or chapati). Do not make it very thin by pressing it too much. Place it on a hot tava/griddle and cook over medium flame. When tiny bubbles starts to rise on the surface, flip it and reduce flame to low. Spread 1/2 teaspoon oil around its edge with the help of spatula and cook for approx 30-40 seconds. Flip it again and spread 1/2 teaspoon oil around its edge. Press it with spatula and cook for 30-40 seconds over medium flame. Repeat flip and press process until golden brown spots appear on both sides of paratha. (No need to spread oil after doing it once in previous steps). Transfer it to a plate and spread butter on it. Prepare remaining aloo parathas by following same process. Serve it with tomato raita and pickle. Knead very smooth dough to roll them out easily. Use milk instead of water to knead dough for softer outer layer. Mash potatoes properly and weed out chunks, if any. This will help rolling them out smoothly. Avoid green chilli if you are preparing it for kids. Add mint leaves or crushed ginger-garlic in stuffing for spicier taste. Based on type of tawa/griddle you are using, you might have to adjust heat intensity while shallow frying. 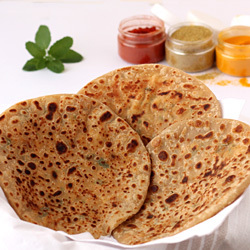 Serving Ideas: Aloo ka paratha is typically served with pudina chutney and curd or with tomato raita and aloo matar paneer in lunch or dinner. However, you can enjoy it with pickle and tea as well in breakfast. Wrap it in aluminium foil and give it in your kids in lunchbox as a healthy snack. 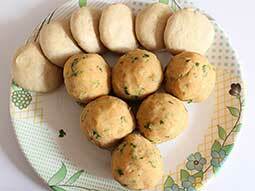 Hi, foodviva your all recipes was awesome, I'll many of them a sev tameta , aloo parotha, dal dhokli and many more. Thank you so much for your such a simple and best recipes. Love u lots2. All are simple and tasty. Alu paratha was very tasty. Nicely explained step-wise to try to prepare for a healthy breakfast. Nice recipe...Easy to make..Thank you. very nice. Rock hard. Cool. Good recipe with nice explanation, want to know whenever I prepare aloo paratha the aloo gets very watery and breaks the paratha please tell me what to do. Response: Hello Anu, follow the below given tips to prevent paratha from breaking while rolling. 1. Make sure that there is no water in boiled aloo (if possible, boil them 30-45 minutes in advance so they will turn little dry or boil them using a steamer). 2. 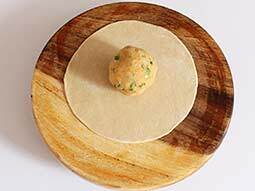 Bind the soft dough and apply very less pressure while rolling the parathas. Your recipe and pictures are excellent. Alu Paratha & Pav Bhaji came out very tasty. Thanks. Very nice and easy recipe, thank you. Very much interesting and it's very easy to do. Thank you. Whatever u have given directions are too easy and good...I love it. Aloo Paratha....came out very nice. Thanks. When I make paratha they become soggy. How to keep it fresh after cooling down. 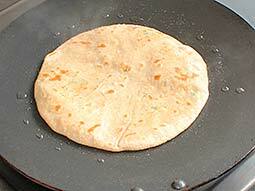 Response: Hello Sara, if you want to make non soggy paratha, keep the outer layer thick and roast it using more oil. Very nice and easy to understand. Thanks for recipe! 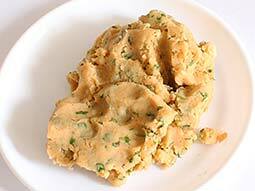 app ki recipe se pariwar me bahut tarif kari again Thanks for delicious recipe! Simple and tasty. Easy and fantastic to cook. Awesome..the recipe was.. Enjoyed making paratha. Hi, do I use boiled water or cold water to make the dough. Response: Hi Michelle, use normal water at room temperature to make the dough. I prepared this for my co-sisters birthday and it was so nice that everyone in my family enjoyed it. Fantastic. Hi, thank you for this super simple recipe of aloo paratha. My family could not believe I made it. It was so divine. Response: Thank you Kantha for trying the recipe. Every one enjoyed aloo paratha that I prepared using this recipe. Adding curd to dough was a good tip. It tasted dhaba style. Thanks for sharing the recipe. Thank you so much foodviva.. With the help of this, I learned cooking in 1 month. 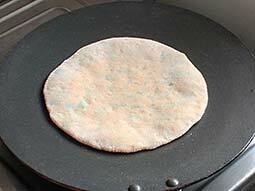 To eat roti, I always have to go to the restaurant but now I can make it my own at home. Thank you. Hi just want to ask do I use warm milk or cold ? Thanks. Response: Hi, you can use milk at room temperature (not chilled) or little warm milk to bind the dough. If you do not want to use milk, you can add 1 tablespoon curd instead of it. Thanks for giving such an easy and quick snack recipe. Thank you very much. It’s very helpful. I loved it. Love it. Thanks...I always wanted to learn this recipe as i loved it very much and its one of my favourite. About the only thing (sadly) that I can handle in Indian cuisine is the bread-based stuff, so I was really glad I came across this post. Thanks for sharing--guess it'll be Indian dinner in this house this week after all!